We here at Superfecta HQ have long been fans of Brass Hat – and that’s not something you can say about many racehorses these days. His first mention on this site came in June 2006, in the wake of his still-irksome DQ from his gutsy second place finish in the Dubai World Cup. (In what perhaps hammers home the point about short racing careers a little too emphatically, the horse who won that year, Electrocutionist, was dead by the end of that year). It may put it in more pleasing perspective to note that now-retired Rachel Alexandra was born the January before Brass Hat went to Dubai – and Zenyatta would not make her career debut until the end of the following year. By that point, Brass Hat had already set a track record at Gulfstream Park in winning the Donn Handicap, as well as another at Churchill Downs. To see Brass Hat return to the track victorious at the age of 9, as he did in the Sycamore, was nothing short of tremendous. 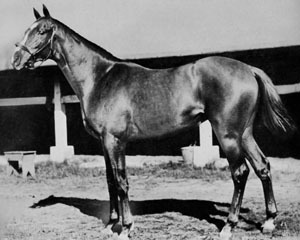 It’s true the gelding is something of a medical miracle, and that his career would likely not have been possible under a zero-tolerance medication standard, but it is also a testament to his connections’ patience and willingness to allow their horse time to rest, recuperate and finally to come back to the races. The father-and-son team responsible for breeding and training the horse, Fred and Buff Bradley, should also be commended for not giving up in the face of a few losses – his efforts earlier in the year have all been solid, and his return to the winner’s circle was greeted by a well-deserved standing ovation. Given the fact that Brass Hat has wins on just about every surface going, it’s almost a shame this win comes so close to the Breeders’ Cup – he’d have a perfectly sporting chance in the Marathon. At this advanced age, G.3 company and the occasional weaker G.2 is probably the highest BRASS HAT can compete. The Breeders’ Cup would have to come up really weak for the gelded son of former BC Turf winner PRIZED to make any impression. I do agree that he is an anomaly in this era of early retirements, winning a graded race at age nine. JOHN HENRY is the older horse I compare all horses to. He won at least 1 G.1 from age five to nine, scoring four G.1′s and HOY/Champion Older Turf Horse hardware at nine! He won nearly 50% of his starts while BRASS HAT clicks at just over 25%. BRASS HAT is a nice, tough horse. I also agree with you that he is well-conditioned by Buff Bradley for his father Fred. Kentucky boys, winning a nice race at historic Keeneland. Not the stuff Secretariat/Seabiscuit-type movies are made of, but I’d certainly love to see a one hour documentary about the raising, racing, care, and love the Bradleys have for BRASS HAT. So well said, it is heart-warming to see the old warrior back in the spot light where he belongs after so many hard fought campaigns. Thanks for stopping by! Rest assured we fans are still annoyed about the Dubai purse situation as well. I’ve always thought that the BC should pick up the supplement fees for Win & You’re In, especially for a fan favorite like Brass Hat – it’s not as though they should be short of cash. 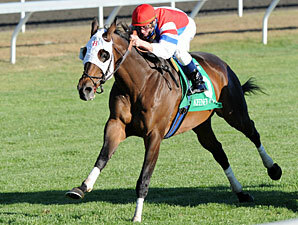 Hope to see Brass Hat back in the winner’s circle again soon!